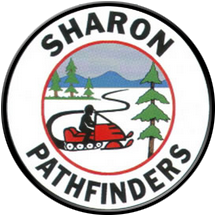 The snowmobile club, SHARON PATHFINDERS, INC., was formed in March 1972 to provide a means for interested families to enjoy the Family Winter Recreation of Snowmobiling. Trails in the vicinity of Sharon Springs were identified, developed and maintained. For the next several years, membership and activities kept pace with the snowmobiling popularity. New York State granted the club “NOT FOR PROFIT” cooperate status in January 29, 1974. Interest in the club followed the snowmobile wane during the late 1970s. However, the 90s brought a rejuvenated interest in snowmobiling. SHARON PATHFINDERS was reorganized to reflect the renewed popularity. Membership grew. The club joined the New York State “Grant in Aid” assistance program in 1998. County-wide grass drag races and other fund raising activities have enabled the club to expand its trail mileage. Other successes include improved trail signage, bridges and modern grooming equipment to insure a safe and pleasant trail system in the Sharon Springs area.